This article is about the municipality in Maharashtra, India. For its namesake district, see Ratnagiri district. For the ancient Buddhist monastery, see Ratnagiri (Orissa). Ratnagiri is a port city on the Arabian Sea coast in Ratnagiri District in the southwestern part of Maharashtra, India. The district is a part of Konkan division of Maharashtra. It is world famous for alphonso mango as it got GI (geographical identification) tag by ministry of commerce of government of india in the year 2018 and also for kokum it also got GI (geographical identification) tag. According to 2011 Census of India, Ratnagiri town had a population of 76,239, males and females constituting 55% and 45%, respectively, of the population. 86% of males and 87% of females were literate. 11% of Ratnagiri's population was under 6 years of age. 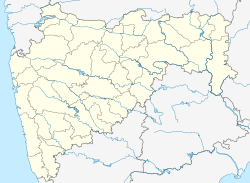 Ratnagiri Municipality was established in 1876. The incumbent president is Mr. Rahul Pandit from Shiv Sena. Uday Samant (Shiv Sena), former Minister of State for Urban Development, represents Ratnagiri constituency in State Assembly since 2014; while Vinayak Raut (Shiv Sena) represents Ratnagiri-Sindhudurg constituency in Loksabha, lower house of the parliament since 2014. Sacred Heart Convent High School, Ratnagiri City. Sacred Heart Convent High School, Udyam Nagar. M. S. Naik High School. The Maharashtra Government under the Department of Fisheries established the Marine Biological Research Station (MBRS) in 1958 at Ratnagiri, which is presently attached with Dr. Balasaheb Sawant Konkan Krishi Vidyapeeth, Dapoli, Dist. : Ratnagiri. The research station has a 10 hectare area as field facility including a three storied building at main campus, a well equipped 'Aquarium and Museum', a modernised brackish water fish farm, a Mechanized Fishing and Research Vessel, Seed Production facilities and various laboratories at its disposal. The Marine Biological Research Station, Ratnagiri is one of the premier institutes, especially in the South Konkan Coastal Fisheries Zone, having a mandate for development of fish production technologies, transferring the technologies to fish culturists, entrepreneurs and the industry, and generating professionally trained manpower in fish culture. Ratnagiri is the birth place of Indian freedom fighter Lokmanya Bal Gangadhar Tilak. He was born here on 23 July 1856 after which he moved to Pune with his family when he was 10 years old. British troops entered Mandalay on 28 November 1885 and Burma was attached to the British Empire on 1 January 1886. Burma would remain part of the British Empire until gaining independence in 1948. 26-year-old King Thibaw was immediately sent into exile with his heavily pregnant wife, his junior queen and two small daughters, and would live out the rest of his life in Ratnagiri, a prisoner of the British Crown. Ratnagiri was chosen for its remote location, some 3,000 miles from Thibaw's former royal seat of Mandalay, accessible only by sea for parts of the year and far from any territory of any rival European power. ^ "Ratnagiri City Population Census 2011 - Maharashtra". Census2011.co.in. Retrieved 18 July 2018. ^ "Maps, Weather, and Airports for Ratnagiri, India". Faiingrain.com. ^ "-". Ggps.com. Retrieved 18 July 2018. ^ "Finolex Academy of Management and Technology". Famt.ac.in. ^ "Government College Of Pharmacy". Gcopratnagiri.com. ^ "Patwardhan Highschool - Ratnagiri". Patwardhanhighschool.com. Retrieved 18 July 2018. ^ "Welcome to R. B. Shirke High School, Ratnagiri". Rbshirkehighschool.com. ^ "Welcome to M. S. Naik Foundation, Ratnagiri". Msnaikschool.edu.in. ^ "Gogate Jogalekar College, Ratnagiri". Resgjcrtn.com. ^ "St. Thomas English Medium School - Forming a joyful generation next". Stthomasratnagiri.com. Archived from the original on 12 October 2015. Retrieved 12 July 2013. ^ "Marine Biological Research Station - Ratnagiri District [Maharashtra State, India]". Ratnagiri.nic.in. ^ "The lost royals". Bbc.com. 24 December 2016. Retrieved 18 July 2018. Wikivoyage has a travel guide for Ratnagiri.